Northville is located on a small peninsula between the Sacadaga River (now the Great Sacandaga Lake) and Hunter's Creek (now the Little Lake). The Village was laid out as a rectangular grid. Some early maps of Northville can be found here: 1890 Burleigh Litho of Northville; 1905 New Century map of Northville; an earlier map of Northampton. Note on the latter that Parkville and Osborne Bridge were flooded in 1930. Some Parkville houses were moved to Northville. Main Street originates from around 1797. A road up to Main Street from a ford in the river (now Washington street) dates from 1794. Northville's location along the Sacandaga River made it a transportation hub for lumber. The opening of the FJ&G railroad line to Sacandaga Park and Northville in 1875 greatly contributed to local economic growth. Sawmills and manufacturing also built the wealth of the community and lead to the construction of substantial residential structures. Most originate from between 1890 and 1910. Based on the 2010 historic resource survey of Northampton there are approximately 50 National Register Eligible (NRE) buildings in Northville. Their location is shown in green on the adjacent map. Click on a number to see the summary listing. 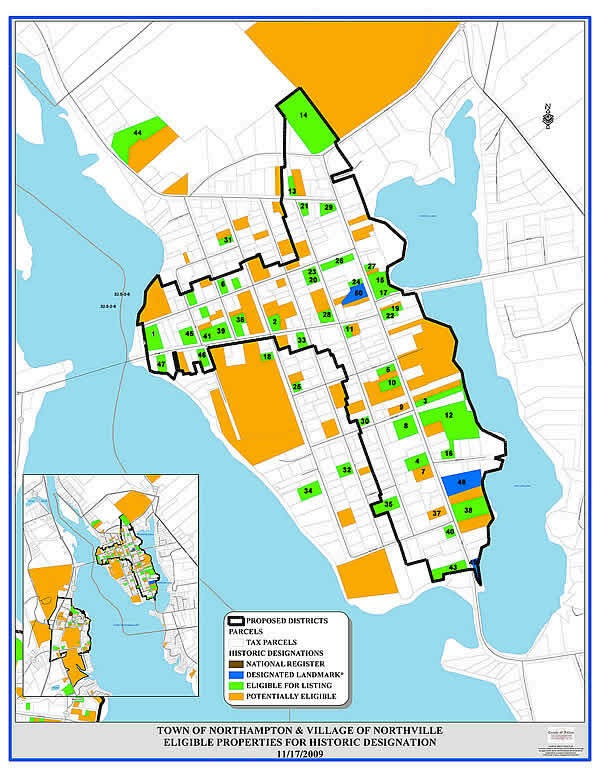 There are another 30 potentially eligible buildings (orange). Eligibility is primarily based on age and architectural integrity. Many are Victorian style or sub styles thereof, such as "Queen Anne" and "Stick". Three buildings - the former Hotel on North Main Street (#50), the Northville/Northampton School House Museum (#48) and the Spier House (#49) on South Main - are listed on the Local Northampton Register (blue). There is one NR listed building in Sacandaga Park (brown; in the inset).